The Dhammapada is the most, popular and best-known text of the pall Suttapitaka. It is a collection of chosen verses picked up from various discourses of five Nikayas. It is pregnant with great significance of practical moral and essential philosophy of Buddhism. Carefully studying concepts of Dhamma in the Dhammapada also help in catching the most specific concepts of the term Dhamma in the entire system of doctrine of the Buddha. In the Dhammapada, the term Dhamma appeared in 48 verses which are summarized in following nine concepts. Just in the first and second verses, Dhamma is used in the sense of cetasikas (mental states). It is also used as law in verse 5; or as Buddhavacana (Buddha's teachings) in various verses. Dhamma also as means, way, state, practice and nature. In some other cases, Dhamma referred to phenomena, Budhipakkhiya Dhamma (Factors of Enlightenment) or as Samatha and Vipassand; or as Nine Transcendental and also as the Truth. Each concept is comprehensively discussed in each section of the present book. Bhikkhuni T.N. TIN LIEN was born in 1951 in Dongthap province, Southern Vietnam. She passed B.Sc. from the University of Cantho (1973), in Vietnam with first division. She was also educated at Vietnam Higher School of Buddhist Studies and got her B.A. in Buddhist Studies as the second topper with distinction (1988). In 1991, she was granted a scholarship by ICCR for her further study in Buddhist Studies in University of Delhi and passed M.A. (1993) and then M.Phil. (1995). Currently she is a Ph.D. researcher of Delhi University. The present work is her dissertation from which she has awarded as Topper of M.Phil degree. 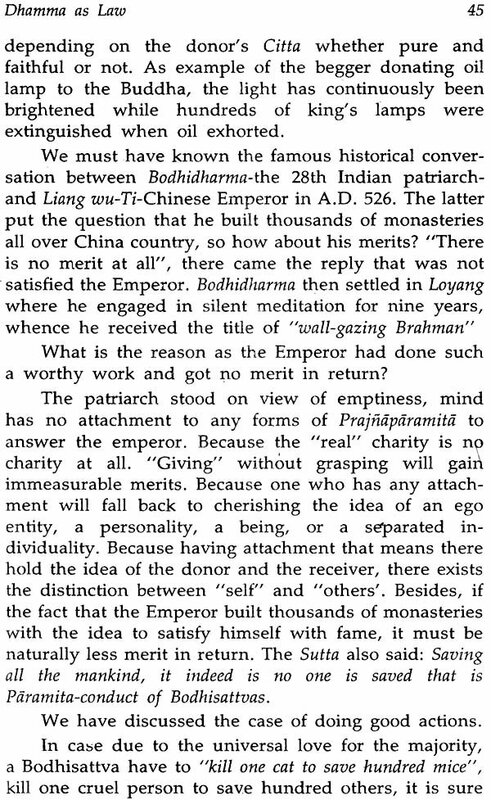 "Dhamma" is a technical term which seems familiar, in fact, so much complicated in philosophical field. It is held on the tongue of philosophers when discussing about the world and the view of life. Especially Buddhist people get used to the term Dhamma throuth Tipitaka, the sacred scriptures containing what the Buddha taught during the course of his life. The Dhammapada is the most popular and best-known text of the Pali Suttapitaka. It is a collection of chosen verses picked up from various discourses of five nikayas. It is pregnant with great significance of 7ractical moral and essential philosophy of Buddhism. Carefully studying concepts of Dhamma in the Dharnapada also help in catching the most specific concepts the term Dhamma in the entire system of doctrine the Buddha. Besides its familiar meanings such as Dhamma as Religion, Duty, or Law which are mentioned in Vedic and Puranic texts and literatures, the concepts of :Mamma in Buddhism are something attractive which ceaselessly urge many researchers to study it under various fields. In the Dhammapada, the term Dhamma appeared 48 verses which are summarized in following nine concepts. Just in the first and second verses, Dhamma Is used in the sense of cetasikas (mental states). It is used as law in verse 5; or as Buddhavacana (Buddha’s teachings) in various verses. Dhamma also as means, way, state, practice and nature. In some other cases, Dhamma referred to phenomena, Budhipakkhiya Dhamma (Factors of Enlightenment) or as Samatha and Vipassand; or as Nine Transcendentals and also as the Truth. Each concept is comprehensively discussed in each section of the present book. 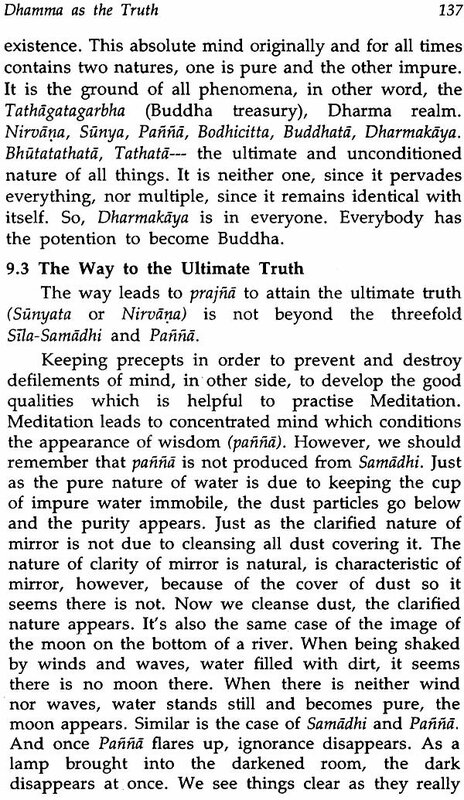 In a nutshell, the term Dhamma in the Dhammapada comprises almost the entire teaching of the Buddha in Tipitaka. Readers are expected not only to read for getting knowledge but also for practising it in daily life. This is the only way we can get more benefit which can be regarded as the true value of Buddha's teaching. Being earnestly encouraged by my supervisor, Dr. Bhikkhu Satyapala, Reader in Buddhist Studies, D.U., as well as the great approval of my good friends, who have gone through this work, I boldly let it published to contribute a tender part in the research field of Buddhism. Sincerely received all good advices from my superiors and readers. The Buddha due to a great cause appeared in this world. It is to show human-beings their ultimate wisdom, how to use it and how to live with it. It is to show the only Holy Path through which men can destroy their sufferings forever, cut off the circle of birth and death forever and get ultimate peace forever. All the Buddha's teachings during the course of 45 years of his life sealed in Sangha's heart, is called Buddhavacana. Pariyattil means the scriptures themselves as a body which is handed down through oral tradition. Patipatti2 from pati+pad, "the way", method, practice, performance....And Bhajana means a bowl, vessel, dish, generally a container. 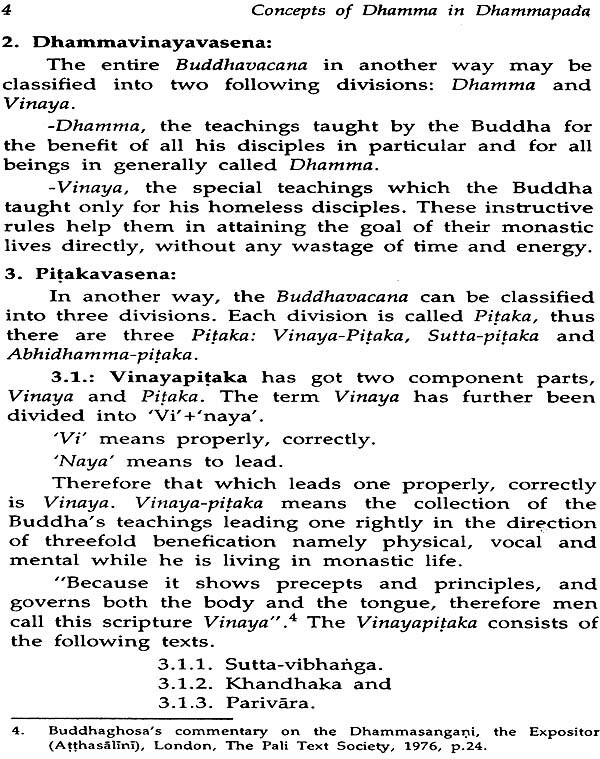 When mentioning the term "Pitaka" we at once direct the mind to the third meaning. Originally, it means "basket". 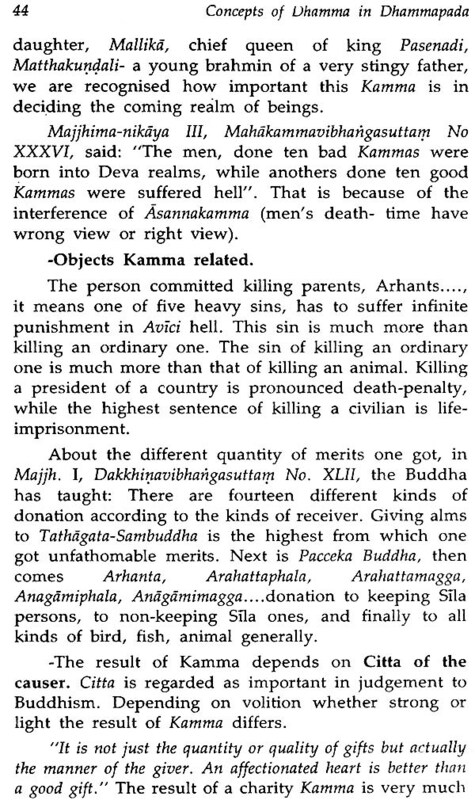 This term appears in many Suttas as a compound word along with the term "Kuddala" (a spade or a hoe) such as in Vin.III 47; D.I. 101; M.I. 127; S.11 88; S.V. 53; A.I. 204; A.II 199; J.I. 225, 336; Kuddala-pitaka "hoe and basket". From this explanation, the original meaning of the term Pitaka becomes very clear. The purpose of this "Pitaka" is to preserve and to carry earth or any such types of items from one place to another without losing anything. It is in this sense scholars have adopted this technical term to refer to a particular literature which preserves the words of the Buddha in its original form through oral tradition handed down to the student by their teachers sincerely. And a person when pondering and practising over these words even a sentence or a verse with a concentrated and faithful mind, he is able to uproot the weeds of ignorance and finally obtain the state of eternal peace that is called Nirvana. Among the ocean of Dhamma, the Dhammapada stands out as a diamond-island and glitters as a lighthouse which men cannot control the thirst of adoration. Before coming to have the analytical study of the concepts of Dhamma in the Dhammapada Scripture, some necessary searches we should get through: -Classification of Buddhavacana, and -Introduction of Dhammapada: its place and importance. Section 2 DHAMMA AS LAW. Section 3 DHAMMA AS BUDDHAVACANA. 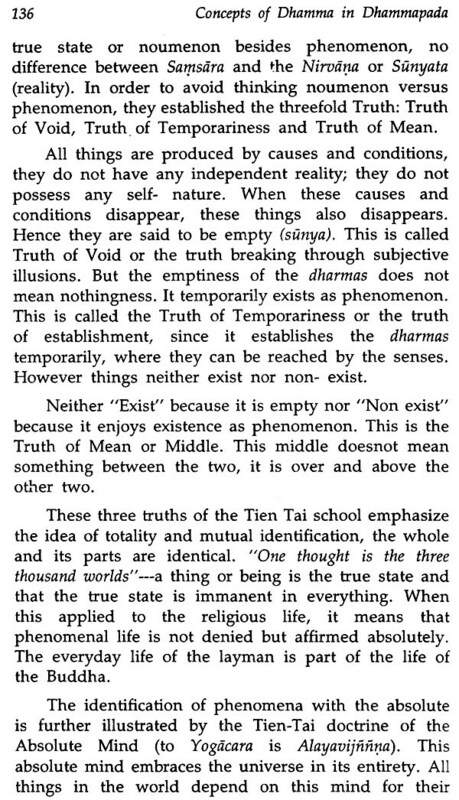 Section 5 : DHAMMA AS PHENOMENA. 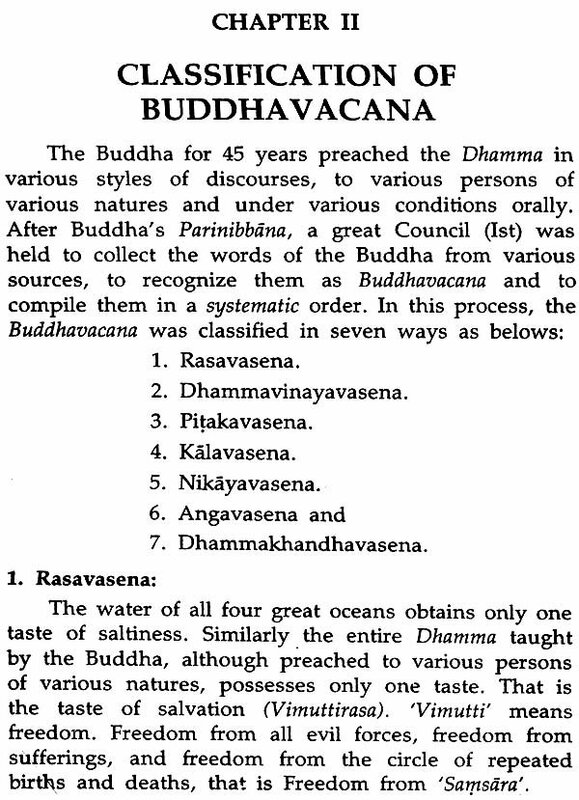 Section 6 : DHAMMA AS BODHIPAKKHIYA DHAMMA. Section 9 Dhamma As The Truth.